If there is one thing you ought to do often, it is to ensure that your Windows 7 PC with its priceless files is free of malware. The only way to do this is using an antivirus application that will help find and get rid of malware on your computer. Malware is any type of software that attempts to cause harm to your or the computer. Variants include viruses, trojans, keyloggers and more. To ensure that your computer is safe you need to employ an anti-malware solution like Microsoft's free Security Essentials application (the software is free for users that have a genuine and validated copy of Windows Vista and 7). Although you should be scheduling Security Essentials to regularly scan your PC, you should run a manual scan whenever you suspect that something's wrong with your PC. Sudden sluggishness, strange activity, and random files are good indicators. In this guide, I will show you how to perform a manual virus scan using Microsoft Security Essentials. 1. To open Microsoft Security Essentials, right-click the Security Essentials icon in the Notification Area on the Windows 7 Taskbar and click Open from the menu that appears. If the icon is not visible, simply click the small arrow that expands the Notification Area which displays hidden icons; right-click the Security Essentials icon and click Open. 2. When the Security Essentials window opens you will notice that there are various tabs and several options to choose from. For the sake of simplicity we are going to focus on performing a scan only, if you wish to update Security Essentials, follow these instructions. In the Home tab you will find several statuses, Real-time protection and Virus and spyware definitions. Both of these should be set to On and Up to date respectively. Quick - This scan will be quick and on the surface so you may not be able to find those viruses or other malware lurking deep in the file structure. 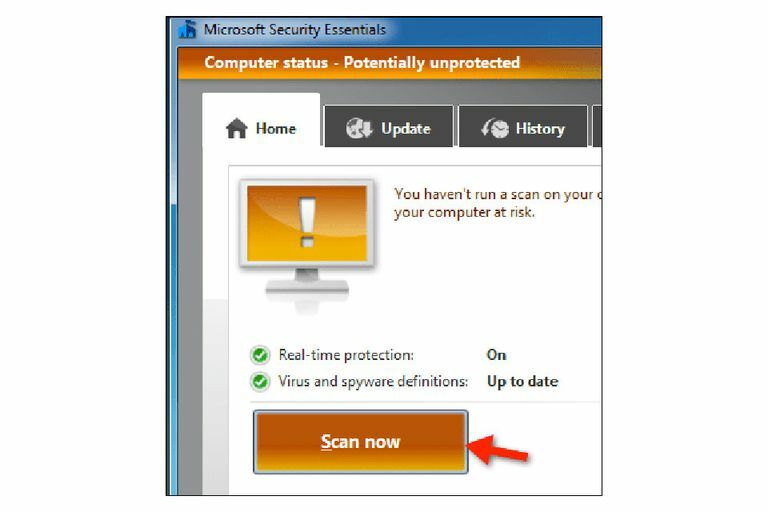 Full - The Full scan is the best option if you have not scanned your Windows computer for viruses in a while. Custom - This option allows you to set specific parameters like where you want to scan and the level of the scan. This is a great option if you have an external hard drive or a memory key you wish to scan along with any other drives attached to the computer. We recommend you perform that Full scan if you have not scanned your computer in a while or if you recently updated the virus definitions. 3. Once you have selected the type of scan you wish to perform, simply click the Scan now button and plan on taking some time away from the computer. You could continue to work on the computer, however, performance will be slower and you will slow down the scan process as well. Once the scan is complete, you will be presented with a Protected status for the PC if nothing was found. If malware was found on the computer, Security Essentials will do what it can to get rid of the malware files on your computer. The key to keeping your computer secure and healthy is to always have the latest virus definitions for whatever antivirus application you are using and to perform virus scans on a regular basis.